Pentagon released this picture of the US military strike on a Syrian air base. Pentaon, the US military headquarters, has confirmed the strike on a Syrian military base in the early hours of Friday. This comes after US President Donald Trump ordered a massive military strike on a Syrian air base in retaliation for a "barbaric" chemical attack he blamed on Syrian President Bashar al-Assad. In a televised address, Mr Trump urged 'all civilized nations' to end the bloodshed in Syria. "We hope that as long as America stands for justice, then peace and harmony will in the end prevail," he said. The chemical attack earlier this week killed at least 70 people, many of them children, in the Syrian town of Khan Sheikhoun. The Syrian government has denied it was behind the attack. At the direction of the president, U.S. forces conducted a cruise missile strike against a Syrian Air Force airfield today at about 8:40 p.m. EDT (4:40 a.m., April 7, in Syria). The strike targeted Shayrat Airfield in Homs governorate, and was in response to the Syrian government's chemical weapons attack April 4 in Khan Sheikhoun, which killed or injured hundreds of innocent Syrian people, including women and children. 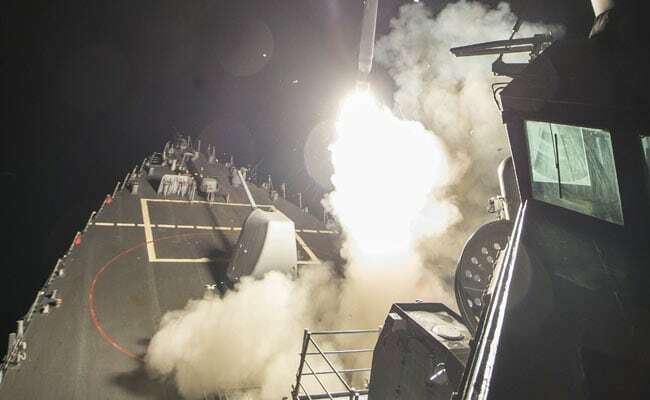 The strike was conducted using Tomahawk Land Attack Missiles (TLAMs) launched from the destroyers USS Porter and USS Ross in the Eastern Mediterranean Sea. A total of 59 TLAMs targeted aircraft, hardened aircraft shelters, petroleum and logistical storage, ammunition supply bunkers, air defense systems, and radars. As always, the U.S. took extraordinary measures to avoid civilian casualties and to comply with the Law of Armed Conflict. Every precaution was taken to execute this strike with minimal risk to personnel at the airfield. The strike was a proportional response to Assad's heinous act. Shayrat Airfield was used to store chemical weapons and Syrian air forces. The U.S. intelligence community assesses that aircraft from Shayrat conducted the chemical weapons attack on April 4. The strike was intended to deter the regime from using chemical weapons again. Russian forces were notified in advance of the strike using the established deconfliction line. US military planners took precautions to minimize risk to Russian or Syrian personnel located at the airfield. We are assessing the results of the strike. Initial indications are that this strike has severely damaged or destroyed Syrian aircraft and support infrastructure and equipment at Shayrat Airfield, reducing the Syrian Government's ability to deliver chemical weapons. The use of chemical weapons against innocent people will not be tolerated.